In 2014, our goal was to make McMinnville the first city in Oregon to divert 90% of our waste from the landfill by 2024.​We have revised our mission recently so recognize what four years of work has taught us. Our current vision is to help McMinnville become a sustainable community by providing programs and education to promote policies that eliminate waste. Zero Waste is a goal that is ethical, economical, efficient and visionary. It guides people to modify their lifestyles and practices to emulate sustainable natural cycles, where all discarded materials are designed to become resources for others to use. ​Zero Waste means encouraging the design and management of products and processes to systematically avoid and eliminate the volume and toxicity of waste and materials, conserve and recover all resources, and not burn or bury them. ​We provide educational and hands-on programs to organizations, schools, hospitals, event sponsors, and local government. We need the community to expand the Zero Waste message and programs. McMinnville Recycled Arts Festival is coming!!!! by Corena Killian who resides in McMinnville with her husband and 7-year-old daughter. With a master’s degree in health care management, she is a partner in a local professional fiduciary firm. Her passion for environmental responsibility led her to Zero Waste McMinnville, where she holds the post of secretary and serves on the organization’s Green Schools Committee. Debris scattered throughout a house under construction near Grandhaven Elementary School in McMinnville. Every day, I walk my daughter to school. Every day, we pass a residential construction site where litter is rampant. Food and beverage waste is dumped on the ground. Small plastic scraps of packaging material, torn off carelessly to access package contents, are left to blow through the neighborhood. Along our neighborhood streets, I find the same evidence of carelessness and lack of concern about our environment and community. I pass residences dotted with chip bags, paper towels, candy wrappers, beer cans, cigarette butts, hazardous spray-cans, discarded socks, abandoned crib covers, empty cracker boxes and chewed gum stuck to sidewalk and road surfaces. In town, it’s not uncommon to pass public employees operating mowers on public grounds. You can witness them run over trash, shredding it into hundreds of minute, irretrievable pieces, either because they aren’t properly trained or don’t care. The rubbish we walk by every day is a symptom of a huge problem. Our plastic-dominated, throwaway culture is killing the planet. It’s well established that plastic enters our waterways and ends up in the ocean, where it disrupts natural eco-balance. As a result, marine life is dying of plastic ingestion and snaring. Microplastics are increasingly found in the tissue of our food sources. Scientists are finding microplastics in fish, chicken, bottled water, beer and more. And we have yet to fully understand the impact of this problem on human life. We have become so desensitized to trash we no longer see it. And that is sending a very strong message to our next generation: It’s not important. It’s someone else’s problem. Littering is a crime. Most of us know this. Trash is unhealthy. Most of us know this too. Yet how many of us take responsibility for conducting cleanups and fostering public awareness? This is our epidemic. We are failing the next generation if we don’t teach proper waste management and environmental responsibility. But that situation can change through the collaborative efforts of environmental groups and educational entities. Clean communities are healthy communities. It’s time for us to better educate ourselves and our kids about sustainability. If there were a place where a substantial portion of our population gathered regularly, sustainable systems already existed, education was a core mission and open minds collaborated on solutions, perhaps rapid change could be achieved. I submit to you this place not only exists, but is singularly positioned to lead McMinnville and Yamhill County in the Earth’s most recent geologic time period — the human-dominated Anthropocene. It’s the K-12 school system. According to Jennifer Seydel of the Green Schools National Network, one in six people visit K-12 school systems on a daily basis to learn, teach or perform support functions. That makes our schools uniquely positioned to change the direction of our community and prepare our children for a far different future. In November, the News-Register published an article about the many outstanding efforts the McMinnville School District is taken by to ensure their facilities are operating sustainably. What we need to complement that is an effort to provide them with the tools and skills to operate in this new environmental reality. It is incumbent on our schools to take up the mantle. I respectfully challenge Yamhill County schools, public and private, to commit today to teaching sustainability to all students, grades K-12. Gather your passionate teachers and enthusiastic students. Round up your community cheerleaders and interested stakeholders. Invite sponsors like Oregon Green Schools, organizations like Zero Waste McMinnville and businesses like Recology Western Oregon — which employs our local Oregon Green Schools coordinator — to assist in the development of your sustainability program. Utilize all these resources to develop your plan and show McMinnville and Yamhill County just how amazing our schools are. Our community will respond when our kids come home from school with new skills and tools for more sustainable living. Parents will take an interest in and inspiration from what their children are doing. It will spread from there. It will be a testimony to our beautiful city when children and families commit to living sustainably, as a result of our schools’ commitment to teaching for the future our kids are facing. And The News Register Reported About the First Day of Styrofoam Collection! McMinnville City Council approves recycling rate increase to support program costs. Recology Western Oregon had asked city council in November to approve a 5 percent increase in monthly trash collection rates next year because of rising recycling costs; but, before the increase was approved, the issue of polystyrene foal recycling arose from Zero Waste McMinnville, which has a goal to make McMinnville the first city in Oregon to divert 90 percent of waste from landfill by 2024. Agilyx Corp. offered to reprocess the city’s discarded polystyrene foam if Recology agreed to establish a drop-off site at its transfer station and provide the hauling services. Recology returned to council to request a 5.5 percent increase rate for 2019 to support the extra costs of the new program. McMinnville City Council Tuesday approved the 5.5 recycling rate increase and commended Recology for proposing a program that fit the city’s recycling needs. Under the program, Recology will accept “polystyrene foam, block Styrofoam packaging material, coolers, meat trays, egg cartons,” single-use cups, utensils and plates and food containers from residents and small commercial businesses at the drop-off site. The hauler thanked Agilyx Corp., Zero Waste McMinnville and McMinnville City Council for support in what it calls a one of a kind venture. Peters mentioned the potential of the program expanding to nonpolystyrene materials as well as to large commercial businesses. 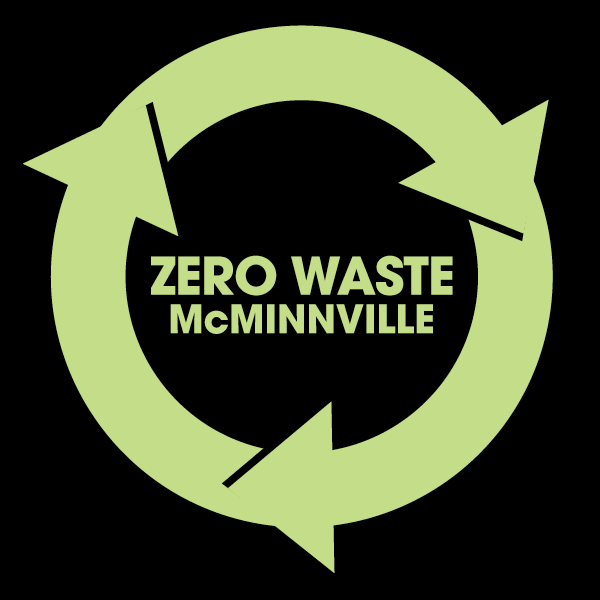 Annely Germain and Ramsey McPhillips chatted with Howie to explain some of Zero Waste McMinnville’s past activities, current programs and things to come. The YouTube video was published December 16, 2018. Watch to hear more about how the City government, Recology and Zero Waste McMinnville brought collection to McMinnville starting December 26th! Each year we take some time after the event season has slowed down to count our blessings. It’s time for all the people who support Zero Waste McMinnville’s mission by volunteering as well as financial contributions to join together to recount how the prior year went and plans and hopes for the future. We can’t achieve our goals without our waste hauler and our waste hauler, Recology, has learned that we can save the City and them money with our programs. This awareness has developed into a relationship that works closely together. On November , 2018 Carl Peters presented a rate hike request to the McMinnville City Council. The changes that have occurred in the recycling market when China and other Asian countries stopped receiving our mixed recyclables has resulted in higher fees as Recology has opted to store our recycling while they develop better disposal strategies, instead of sending the items to the landfill. The November 27th McMinnville City Council meeting continued the discussion about Recology’s rate increase. People from Recology start speaking at the 24:00 mark and public comment (Mostly Zero Waste McMinnville people) at 43:00. We at Zero Waste McMinnville support the rate hike but request that Recology begin a Styrofoam/polystyrene collection system with materials trasnported to Agiilyx in Tigard for processing. Students at Grandhaven Elementary School place compostibles in one bin, recyclables in another after lunch. Composting and recycling reduce the amount of trash in the McMinnville School District, in addition to benefiting the earth, according to Cindi Hiatt-Henry, director of the nutrition services program. The district also does what it can to reduce waste created by construction projects, said Pete Keenan, director of facilities. Hiatt-Henry said kitchens at all the schools save food scraps and recycle paper, cardboard and cans, as well. The catering program uses compostable plates and bowls, and Mac High and after school programs use compostable trays. “We didn’t want to put more plastic in the landfill,” Hiatt-Henry said of the switch to a material that degrades rapidly without becoming toxic. Students at several schools separate their different waste materials into labeled bins. Sets of these bins are set up in cafeterias as well as spaces across the district, teaching both students and adults the importance of reusing and recycling. “We all value this, and we’re always looking for ways to be green,” Hiatt-Henry said. McMinnville school kitchens began composting four years ago. Hiatt-Henry said the district was the first large organization in McMinnville to do so. Hiatt-Henry said her staff worked with Recology to determine how much was being composted in district kitchens. In one week, the amount totaled 900 pounds. Recology collects recyclable items. A farmer adds the food scraps and other compostable items to a compost pile. As far as construction is concerned, Keenan said crews have made an effort to use green practices during the 2017 remodeling and building projects, and they’re continuing as they build the new high school gym and other families at Mac High. Hazardous materials were removed and disposed of by specialists after destruction of the old gym and other facilities. Crews recycled many items, including metal scraps, rebar and wire, Keenan said. The green practices extended to the new lights, which are fitted with LED bulbs. And 1.5 percent of the high school construction project is devoted to solar power. Keenan said the district wants to increase its use of solar power, which has been part of Sue Buel School since it was built in 2007-08. The solar panels there have had “a very quick impact” on reducing electricity use, he said. Throughout the district, workers dismantle old furniture and equipment and save whatever they can. Metal scraps are purchased by a Salem company, Keenan said. They recycle electronics, as well, and correctly dispose of paint, chemicals and light bulbs. Keenan added the district is concerned about keeping pollutants out of water, too. Grease traps are installed in kitchen sinks. The water runoff grates in school parking lots are equipped with stickers warning people not to pour hazardous materials into the drain. By Tom Henderson • Staff Writer • June 22, 2018 ! Tawna Parker’s family didn’t practice composting when she was growing up, either, but for a completely different reason. “It’s something I’ve picked up as I’ve gotten older,” Parker said. “When I was growing up, we just cleared out the fridge, pulled the trash can over and put it in.” Now both women not only practice composting themselves, they encourage others to do the same through Zero Waste McMinnville. The local environmental group seeks to reduce (and possibly even eliminate) material that otherwise ends up in the landfill. Members of Zero Waste regularly stand guard at the McMinnville Farmers Market, local festivals and other public events, directing people on how to sort their trash. They were also the driving force behind the McMinnville City Council’s decision last year to ban nonreusable plastic bags at local retailers. and stream reclamation, and wetland construction, he said. Parker and her partner have operated the farm for the last four years. They had never been to Oregon when they decided in 2012 to travel through the World Wide Opportunities on Organic Farms program. The program connects those interested in learning organic methods with farmers throughout the world to promote cultural and educational experiences. Parker and her partner settled in McMinnville and started Gratefull Gardens on land they lease from Jackie Dole. “We wanted to learn to grow our own food and be sustainable,” Parker said. For Lutz, part of being sustainable includes teaching people how to make simple composting bins with the help of worm castings. “It’s really just worm poop,” she said. The bins need plenty of water. “Worms breathe through their skin so they need moisture,” Lutz said. Not any old worms will do. Lutz said people should use red wigglers. Nature practically designed them for composting. “They don’t survive in the ground,” she said. “They need stuff like this.” Wait a minute. They don’t survive in the ground? They’re worms. “You’re going to have to Google that,” said Lutz. Google actually does have an answer to that question. Lutz is right. Red wigglers — or Eisenia fetida — are a species of earthworms that have adapted to decaying organic material. They thrive on rotting vegetation, compost and manure and are rarely found in soil. Lutz knows exactly what they like. “I have a recipe here for worms,” she told a visitor. For more information on the specifics of composting, visit zerowastemcminnville.org/composting. 23. They regularly buy fresh fruits and vegetables at the Saturday Market at the grange. The important thing is that nothing gets thrown away— whether it’s an apple core or an air mattress with a slow leak, she added. The apple core can be used for composting, and the air mattress can be repaired.“There is no such thing as ‘away,’” Rankin said. Thanks to the 7th Grade Leadership students at Duniway Middle School a whole lot of people now know about the problems associated with plastic in our oceans. Five students, Opal Primozich, Uke Halloran-Steiner, Margaret Bowman, Caden Huber, and Kellen Reed showed the movie Plastic Ocean as a benefit for Zero Waste McMinnville at 3rd Street Pizza. The event sold out with families lining up on Third Street trying to get in to see the movie. It is a topic that people need to see… a harsh documentary depicting the destruction of our oceans with endless amounts of discarded plastic trash. Some people found it too sad and walked out… many viewers were moved to tears. The kids chose Zero Waste McMinnville and this movie to raise money and awareness because they know it is a poignant issue in today’s world. These savvy ‘eco-tweens’ from David Holmes Leadership class at Duniway have raised over $1,000 bucks for Zero Waste McMinnville by working with Third Street Pizza to show the movie, collecting bottle and cans, selling plant starts at EARTH NIGHT, organizing donations from Four Elements Yoga classes, and orchestrating “Hat Day” where everyone could pay a dollar to wear an otherwise forbidden hat to school. So ingenious! The movie that they chose to screen ended with a lot of things we as a society can do to stop the tide of plastic pollution circulating from sea to sea and these smart engaged kids are just the team we need to lead the way. Hardy congratulations, and warm thanks goes out from Zero Waste McMinnville to these smart, engaged students who are on their way to making our planet a better place to live. Early on we realized that we needed to raise public awareness of our organization and our mission, and that a good way to do this was to become involved in local events. With this in mind, starting in Spring 2015 we have worked with the organizers of major city and private events to coordinate waste collection and separation into recyclables, compostables and true trash residual that goes to the landfill. Our goal is to achieve 90% diversion (recyclables + compostables) of the event waste stream, mirroring our overall organizational goal. We have been supported in our efforts by a 2015 grant from the CAN’d Aid Foundation Crush It Crusade that we used to buy our first sets of equipment for local events, and by a follow-on 2017 CAN’d Aid grant that allowed us to upgrade our equipment to the ClearStream Recycling units that we’re now using. Our events range from smaller, one-day festivals such as the Garden Faire or Sabor Latino, to large, multi-day events such as the UFO Festival, TurkeyRama or the International Pinot Noir Celebration. Whereas a small event might require only 3 or 4 volunteers, each working a typical 3-hour shift, the large events need 60 or more volunteers in a variety of roles – from standing by one of our recycling stations to help the public get their discards into the correct bin, to doing a final sort on the bags brought in from the bins to minimize contamination of the streams. As our event experience grows, so does our diversion effectiveness. In the 2015 event season, we filled 225 volunteer shifts and logged 1000 volunteer hours, and achieved a diversion rate of 82%. By 2017, with several more events, we filled over 250 shifts and logged more than 1100 hours, and achieved a diversion rate of over 89%. This is truly a team effort! The Bag It Better campaign made good effort to get the word out to McMinnville residents about the program. Larger stores initiated the project September 1, 2017 and small stores will be involved starting March 1, 2018. McMinnville’s local radio station (1260 on the AM dial) provides musical entertainment and information about local issues. January 10, 2018 several members of McMinnville Zero Waste were interviewed to explain more about the goals and programs.